I am struggling to work out if You Were Never Really Here is a victim of being over hyped or just not being very good. I am pondering this because after months of people raving about the film, numerous awards, and friends saying it is their top ten films of 2018 I sat down and watched the film was underwhelmed. 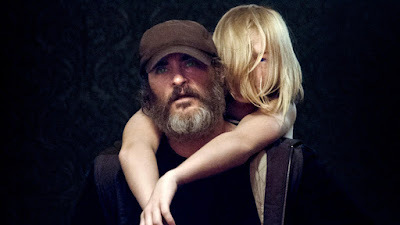 The film has Joaquin Phoenix playing man who is very good at rescuing children. Living off the grid and unafraid of bashing heads with a hammer he brings kids to safety. His latest job, at the request of a senator, is to rescue a certain girl from brothel specializing in underage children. Phoenix leaves a trail of bodies but gets the girl. Soon after the police show to a motel room, kill the clerk and kidnap the girl back. It seems the girl is favorite of the governor. Then again I could be over reacting to what is here since several people I know have been talking this film up as this year’s equivalent to the discovery of sliced bread. I like the film but nowhere near that much. IS it worth a look? Yes. While I don’t think its great I did like it. Perhaps if you can keep the raves out of your mind you’ll like it more than I did.